by: Jennifer Wood Media, Inc. The “Saturday Night Lights” series continued on January 19 with the $72,000 NetJets Grand Prix CSI 2* and Olympian Mario Deslauriers (CAN) and Amsterdam 27 scoring a win under the lights at the Palm Beach International Equestrian Center in the second week of the 2019 Winter Equestrian Festival (WEF). The 12-week WEF circuit features hunter, jumper, and equitation competition and continues through March 31, 2019, at the Palm Beach International Equestrian Center. 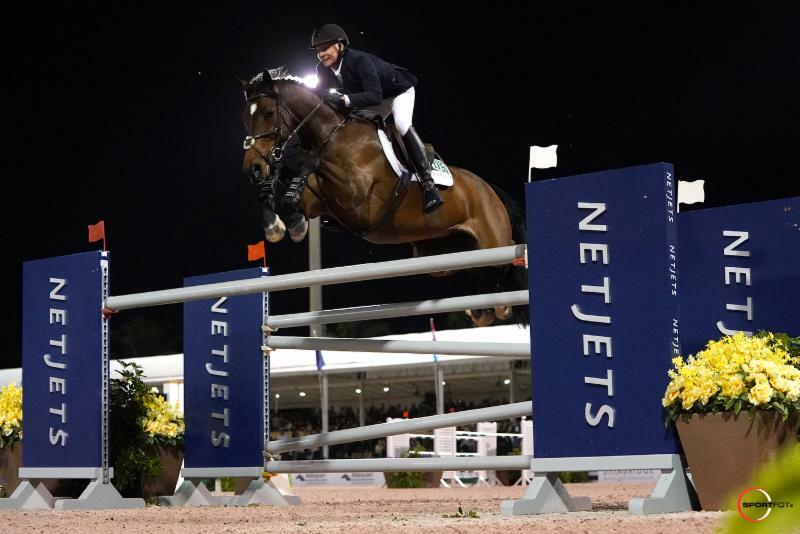 Highlight events of the final day of competition during WEF 2, sponsored by NetJets, include the $25,000 Hermes Under 25 Grand Prix on Sunday, January 20, at 8 a.m., followed by the $36,000 1.45m CaptiveOne Classic. There were 45 entries in the grand prix, and eight were able to go clear over a course designed by Oscar Soberon of Mexico.